Frederic Tozere ... Jeffrey Gilland Sr.
Johnny Rutledge: The prettiest girl in the world couldn't get me - I'm woman-proof! I`m a huge William Holden fan and I enjoyed this film very much.I like the nostalgic American mid-west turn of the century time setting of the film.Bill Holden has great interaction with the children-his true gentle sweetness when singing "In The Gloaming" as a lullabye to the little girl shines through.The scene with Bill trying to sew the little girl a dress from a pattern is hysterical.Buddy Clark did a wonderful job of dubbing his voice to match Bill Holden`s-if I didn`t know better,I would swear it was Bill singing. 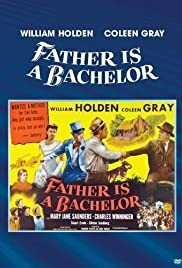 A nice family film with great sentimental, turn of the century songs with a wonderful, funny, sweet performance from Bill Holden.Its a shame Columbia has never released this on video or DVD.I obtained my copy from a private collector.